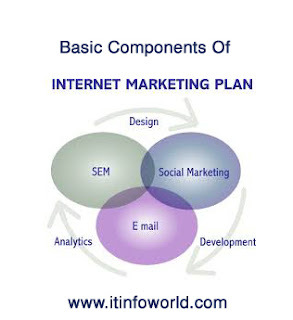 Basic Components Of An Internet marketing plan In this article, I will discuss the Basic Components Of An Internet marketing plan. The Internet is one of the components of the information technology. It has become the major tool for business marketing too. Any business wants to survive and want to compete must have its Internet presence nowadays. Most of the business knows it, and they have already taken steps to be on the Internet market. However, not all the businesses are very successful with their Internet presence. Main cause if this is the lack of proper Internet marketing plan. In this article, I will discuss the Basic Components Of An Internet marketing plan. The Internet is one of the components of the information technology. It has become the major tool for business marketing too. Any business wants to survive and want to compete must have its Internet presence nowadays. Most of the business knows it, and they have already taken steps to be on the Internet market. However, not all the businesses are very successful with their Internet presence. Main cause if this is the lack of proper Internet marketing plan. Determining the goal could be the first marketing components to the business. You have to set what you want to achieve with your online presence through a website. If you do not have a target, you cannot archive anything. You must set a target. You must determine the possible time to achieve your target. You must chalk out the tasks to be done each day to achieve your target. Finally, you must stick to the routine. The target of Internet success cannot be achieved overnight. Consistency is the means of success here. Analyzing the Internet market around that particular business is necessary. You have to see what and how your competitors are doing on the Internet. Collect as much data as possible and analyze the data to assess their position. You have to visit their website to see and understand how they have set up their campaign. What are the issues missing there? What are the issues you can exploit? Your competitors are your best guide to make you a successful marketing plan. Setting up a strategy is the next important step. You have to set up strategy to achieve your online goal. You have to take and implement strategies to stay ahead of your competitor at the Internet. This is one of the most important marketing tips. One issue is to be noticed here. You must set your marketing strategy according to your strengths. Must Read: Submit your article. You will never be successful unless you judge your strength properly. You can include the issue that you do not have expertise. Sometimes it becomes necessary for the competition’s sake. You have to outsource these types of issues. You have to plan your budget carefully and in advance. Once you set up a marketing plan you have to stick to it until success shows up. If you are not an Internet marketer, and have a thorough knowledge in the Internet marketing, it is highly unlikely you can take appropriate steps to fulfill the three marketing tips. In that situation, you should hire an Internet marketing consultant to formulate your marketing strategy. It is to be noted that, making a marketing strategy is not enough to be successful on the Internet. You have to prepare a workforce with appropriate professionals to implement the strategy. Your strategy must be updated constantly to coop with the ever-changing scenario of the Internet marketing. Now you know the most important elements in setting up an internet marketing plan, go out there and start building your business with confidence. One of the best ways to achieve this is to get the right internet marketing plan training that will take years off the learning curve.